Combine cacao powder with salt, vanilla and sweetener. Add the melted cacao butter or coconut oil. Mix well. When the chocolate fluid of life is ready, lovingly pour it into the little round forms to create the baskets. Place them in the refrigerator for no longer then ten minutes to semi harden. While waiting, prepare the nuts and design your creations, giving it loving thought. 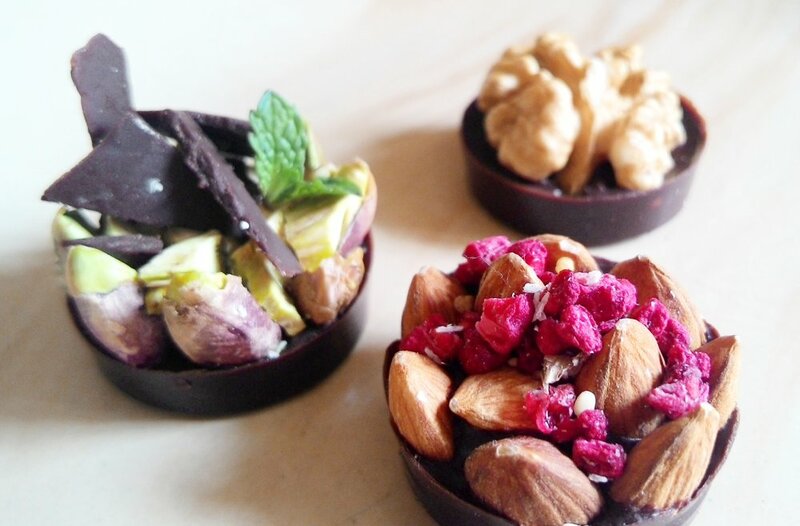 Get the chocolate baskets out and fill them up with nuts any way you wish. This is your chance to chocolate rock-n-roll. Transfer back to the refrigerator for another 30 minutes. A tip: Little mint leaves, stripes of orange peel, cacao nibs, dried or fresh flowers, shredded coconut, edible gold flakes, and much more can be used to make this creation absolutely rock. You did not know that you were a real raw chocolatier. Did ya? Stay healthy. Be well. Take care of your Self and your loved ones.